Hawaiian Telcom, Inc., is the incumbent local exchange carrier (ILEC) or dominant local telephone company, serving the state of Hawaii. It is owned by Hawaiian Telcom Holdco, Inc., which was formed in 2005 by The Carlyle Group, following its purchase of the Hawaiian assets of Verizon Communications. Hawaiian Telcom provides a wide range of consumer, business, wholesale communications and technology services. Service offerings include local phone, long distance, internet services (DSL and Fiber Optics), and television service; along with wireless service such as a mobile virtual network operator using leased capacity provided by Sprint and Verizon Wireless's CDMA networks on the consumer side. Hawaii operations of Verizon Wireless were not included in the 2004 sale to The Carlyle Group, and Verizon Wireless continues to operate in Hawaii as before the divestiture. Among the company's business offerings are a full range of Internet Protocol services (IP), including ethernet, high-bandwidth data services, managed services and cloud-based services. Hawaiian Telcom was founded in 1883 as the Mutual Telephone Company, chartered under the Kingdom of Hawaii. An original owner was Archibald Scott Cleghorn, father of Princess Ka'iulani. It was the second telephone company chartered in Hawaii, after the Hawaiian Bell Telephone Company in 1880. Mutual took over Hawaiian Bell in 1894. With the acquisition of the phone service of the Hawaiian Pineapple Company on the island of Lanaʻi, Mutual owned the phone system of the Hawaiian islands. Mutual changed its name to Hawaiian Telephone Company in 1954. In 1967 Connecticut-based GTE Corp. acquired Hawaiian Telephone and renamed it GTE Hawaiian Tel. After the 2000 merger of GTE with New York-based Bell Atlantic, forming Verizon Communications, GTE Hawaiian Tel became Verizon Hawaii. In 2004 Verizon Communications finalized a deal to sell Verizon Hawaii to the Washington, D.C.-based investment firm The Carlyle Group. At the time, Carlyle's purchase of Verizon Hawaii was quite controversial with the public and competitive local exchange carriers, Time Warner Telecom and Pacific LightNet, who had doubts about the Carlyle's lack of experience operating telecommunication businesses, and their intentions as to raising rates, upgrading the network with optical fiber as former-parent Verizon was doing on the mainland, and possible resale of the business in just a few years, all seen as being detrimental to the public interest. Hawaiian Telcom announced on February 4, 2008, that it was replacing CEO Michael Ruley with turnaround expert Stephen F. Cooper, chairman of Kroll Zolfo Cooper. Cooper's previous management engagements include Enron and Krispy Kreme. On May 8, 2008, the company named Eric Yeaman as its new CEO, succeeding interim CEO Cooper. Yeaman previously served as Chief Operating Officer of Hawaiian Electric Company, the electric utility serving the island of Oahu. The company also announced that Walter Dods, former president of First Hawaiian Bank and one of several local investors in Hawaiian Telcom, was assuming the role of Chairman of the Board. On December 1, 2008, the company filed for Chapter 11 bankruptcy after missing an interest payment on its debt. With the bankruptcy, The Carlyle Group's ownership had been reduced to a small stake. In November 2009, Cerberus Capital Management announced to the bankruptcy court that it had acquired $7.6 million of Hawaiian Telcom's debt. The company's plan to reduce its debt by more than $800 million was approved by Judge Lloyd King of the U.S. Bankruptcy Court on November 13, 2009. The plan required approval by the Hawaii Public Utilities Commission. After leaving bankruptcy, the company's stock became publicly traded in 2010, moving to NASDAQ in 2011. On June 24, 2011, The State of Hawaii Department of Commerce and Consumer Affairs issued a 15-year cable franchise license to Hawaiian Telcom, thus ending Oceanic Time Warner's 35-year monopoly as the state's sole cable TV provider. 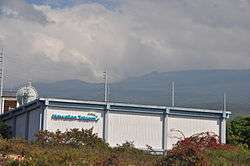 Hawaiian Telcom launched the service on July 1, 2011, after a year of testing in the Honolulu area. Island-wide service began in 2012. 1 2 3 4 5 Sokei, Debbie; Hao, Sean (2004-05-22). "Local Verizon workers optimistic". The Honolulu Advertiser. Retrieved 2014-12-28. ↑ "Hawaiian Telcom gets a license for cable TV". Honolulu Star-Advertiser. ↑ Creamer, Beverly (January 2012). "Hawaii Business CEO of the Year: Eric Yeaman". Hawaii Business Magazine. Retrieved 2014-12-28. ↑ "About Hawaiian Telcom". Retrieved December 28, 2014. ↑ "Number, Please". Ho‘okuleana. March 10, 2013. Retrieved December 28, 2014. ↑ Martin, Dan (2004-10-06). "Union supports Verizon suitor". Honolulu Star-Bulletin. Retrieved 2004-10-10. ↑ Wu, Nina (2007-02-09). "Hawaiian Telcom hires new help". Honolulu Star-Bulletin. Retrieved 2007-02-09. ↑ Consillio, Kristen (2008-02-05). "Hawaiian Telcom ousts CEO". Honolulu Star-Bulletin. Retrieved 2008-02-05. ↑ "HECO executive named president of Hawaiian Telcom". Pacific Business News. 2008-05-08. Retrieved 2008-05-08. ↑ "Carlyle's Hawaiian Telecom Bet Goes Belly Up". Washington Post. 2008-12-01. Retrieved 2008-12-02. ↑ "Hawaiian Telcom's $460M reorganization gets OK". Honolulu Advertiser. 2009-11-14. Retrieved 2009-11-20. ↑ Sophie Cocke (December 27, 2010). "Hawaiian Telcom starts trading stock". Retrieved December 11, 2011. ↑ "Hawaiian Telcom Common Stock Begins Trading on NASDAQ under Ticker Symbol "HCOM"" (Press release). 2011-07-05. Retrieved 2011-12-12.